The U.S-Mexico border wall may or may not be under construction, but it’s not the only contemporary attempt at a barrier between countries. According to some reports, there are currently 65 international border walls either completed or under construction. Compare that number to the 16 border fences in existence around the world when the most famous concrete barrier of the 20th Century—the Berlin Wall—came down in 1989. Globalisation was supposed to tear down barriers, but security fears and a widespread refusal to help migrants have fueled a new spate of wall-building across the world, with a third of the worlds’ countries constructing them along their borders. While walls built in previous millennia aimed at keeping attacking armies out, and while the Berlin Wall was built to keep people in, modern-day walls have other purposes. Our current US President thinks that a wall on the US-Mexico border will keep out ostensible “drug dealers, rapists and murderers.” Some European countries are fencing themselves off to prevent migrants—mostly fleeing from the war in Syria—from entering their territory. Bulgaria: The country built a wall along the Turkish border, which was completed in August 2015. It marks the beginning of the walling off of Europe, as some are referring to it. Hungary: Hungary completed its wall along the Serbian border on 14 September 2015, and the wall along the Croatian border a month later. Slovenia: Slovenia built a razor sharp fence, cutting across the Croatian border in November 2015. Macedonia: At the end of November 2015, Macedonia completed a wall along the Greek border topped with barb wire. Austria: In April 2016, Austria began construction of a ‘fence’ along the Italian border. France: Now France joins them, funded by the UK. Botswana-Zimbabwe border: Building began in 2003 of this electric fence, which is about 300 miles long. The official reason Botswana began building a fence along its western border with Zimbabwe is purportedly to stop the spread of foot-and-mouth disease among livestock. However, Zimbabweans believe that it is really intended to keep people from migrating into Botswana since the 2000 land reform policy in Zimbabwe resulted in an economic crisis, leaving many desperate and in search of employment. India is constructing a barrier to prevent illegal immigration and the smuggling of weapons and narcotics from Bangladesh to the Indian state of Assam. In recent years, it has been a site of particular focus for Human Rights Watch (HRW) because of the border patrol’s controversial shoot on sight policy. HRW reported in 2010 that over 900 Bangladeshi, including children, had been killed by both sides along the border in the last decade alone. Kuwait-Iraq border: Building began 1991. Electrified fencing, concertina wire, trenches, dirt berms. After the 1990 Iraqi invasion of Kuwait, international military intervention and the defeat of Iraq, the Kuwait-Iraq barrier was constructed by the United Nations Security Council to prevent future invasion by Iraqi leader Saddam Hussein. The separation barrier extends six miles into Iraq, three miles into Kuwait, across the full length of their mutual border from Saudi Arabia to the Persian Gulf and is guarded by hundreds of soldiers, several patrol boats, and helicopters. In July 2010, the Iranian Interior Minister…announced that the country would be building walls along its entire border with Iraq, Turkey, Afghanistan and Pakistan. The government has purportedly allocated 150 million dollars for this purpose. Pakistan-Iran barrier: Building began in 2007. Reinforced concrete, earth and stone embankments, deep ditches, observation towers and garrisons. The Iran-Pakistan barrier is a separation barrier which Iran in the process of reconstructing and fortifying along its border with Pakistan. The Pakistani Foreign Ministry has said that Iran has the right to erect border fencing in its territory to deter drug smuggling and illegal crossings. However, the Provincial Assembly of Balochistan (Pakistan) opposes the wall. They maintain that it will create problems for the Baloch people, whose lands straddle the border region, dividing them politically and impeding trade and social activities. The Iranian government has built a long wall on its border with Iraq to stop drug and weapons smuggling. However, according to Iraqis and Iranians living near the border, the wall has created employment problems for the Iraqis. It is also reported that Iran has issued IDs to Iranian smugglers to regulate their activities. Saudi Arabia-Yemen barrier: Construction, by Saudi Arabia, began in 2003, but stopped in 2004, when Yemen objected , stating that it violated a border treaty signed in 2000. Other European countries appear to be climbing on the border-wall bandwagon. In 2015, the Baltic nation of Latvia was reported to be building a large-scale fence along its Russian border to keep out migrants who attempt to illegally cross the border. Recent reporting indicates that Lithuania also plans to build an 81-mile border fence, along its Russian border. …Such a fence would provide little defense against a full-blown military assault but said it underscored Lithuanians’ concerns about a more assertive Russia and could also help prevent lesser cross-border incursions. In addition, Estonia says it wants to build a 70-mile-long fence along its eastern border with Russia, “to boost security and protect the EU’s passport-free Schengen zone.” Construction reportedly will begin in 2018. When is a border wall not a border wall? The Indian Line of Control Fencing: A double-row of electrified fencing and concertina wire 8-12 feet high, landmines and surveillance systems. 340 miles along the disputed border. The Line of Control separates Indian and Pakistani states that both countries would like to claim as their own. The Berm: Constructed in 1980. 10-ft.-high sand walls, landmines. The Berm, the largest minefield in the world, divides Morocco and Western Sahara. The Moroccan Wall, or The Berm, divides the entire area of Western Sahara. 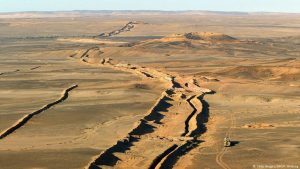 Morocco built the wall in response to efforts to establish Western Sahara’s independence. The wall initially contained just a small northwestern part of the territory, but by building a succession of six different walls, the Moroccans expanded their occupation to the majority of the contested land. Ceuta and Melilla Borders [Spain-Morocco]: Built around 2000. Three rows of high wire barricades ranging from 16 to 20 ft high. Six miles, surrounding both cities. Ceuta and Melilla are free port cities on the northern tip of Africa under Spanish control since 1986. Both cities are surrounded by Morocco, which disputes Spanish sovereignty over them. Spain built the fences to deter Africans from migrating to Iberia through these ports. In 2005, fifteen people were killed trying to cross over the barrier. Still many try to make it over, some getting caught in the process or drowning while attempting to make the sea crossing. Human trafficking is common. Those are just examples of a burgeoning trend. One enterprising researcher at World Atlas has compiled a very helpful chart listing every country with a border wall, the country it is trying to keep out, and the status of the wall, as of 2017. I found it surprising and informative. For example, I didn’t know that Kazakhstan has a border wall with Uzbekistan. Why all these border walls? Why now? Nations—even cities—have attempted to wall themselves off from marauders, migrants and criminals for thousands of years. Sometimes the walls worked, but usually not forever. If you grew up in America in the Post World War II era, you may have thought that walls were quaint relics of an ancient past, and that we lived in a more enlightened, more connected world than one that could be fenced off. Unfortunately, we were wrong—as we learned when the Berlin Wall went up in the 1960s. But even that didn’t last forever. And when that wall came down, many of us thought that the era of walls was finally over. Wrong again. We now live in a world in which countries, nationalities, ethnic groups, religions, and political parties are retreating into a defensive, some might say paranoid, crouch. New border walls are a physical, institutionalized manifestation—on a grand scale—of that attitude, even if the new walls are more theater than they are true barriers. But self-preservation is a powerful motivator, and building a wall is a primal reaction. Maybe peaceful co-existence behind an electrified, razor-wire-festooned, concrete barrier is a good solution. But I hope not.